I heard of Salt + Smoke before I even saw the yellow awnings on the Loop. My friend went there for dinner and came back with rave reviews, so I knew that the restaurant was next on my “Eat Everything in STL Before I Graduate” list. Salt + Smoke offers all types of barbecue items so if you’re not a red meat type of person, not to worry, there are still plenty of dishes to satisfy your meaty, messy cravings. Salt + Smoke opened this past summer in the restaurant space that used to house Nico, a casual greek restaurant. Although the ownership and location stayed the same, the cuisine and atmosphere made a total 360. Salt +Smoke’s owner Tom Schmidt and his team wanted to take their business in a new direction and decided to invest in in-house smoked and cured meats. Their smoker is actually located in the back of the restaurant and produces the restaurant’s main attraction: St. Louis style BBQ. Appetizers range from burnt-end toasted raviolis to hush puppies with maple butter. 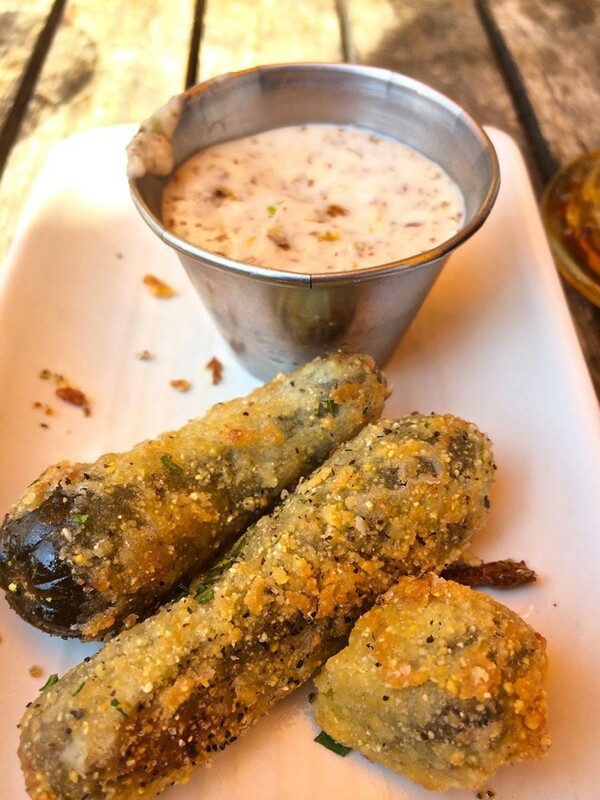 I started my meal with the fried pickles, which were probably the best fried pickles I’ve ever had… and I’ve eaten quite a few fried pickles in my time. They were served in a variety of sweet and salty spears, chips, gherkins and were perfectly breaded and fried. For the main course, I chose a pulled-chicken sandwich with pimento cheddar and sweet corn relish, which I dipped in one of their three barbecue sauces for an extra flavor. The sandwich roll was buttered and toasted (a must) and was overloaded with a hefty portion of the chicken. Despite its size, I eventually finished the entire monstrous dish. 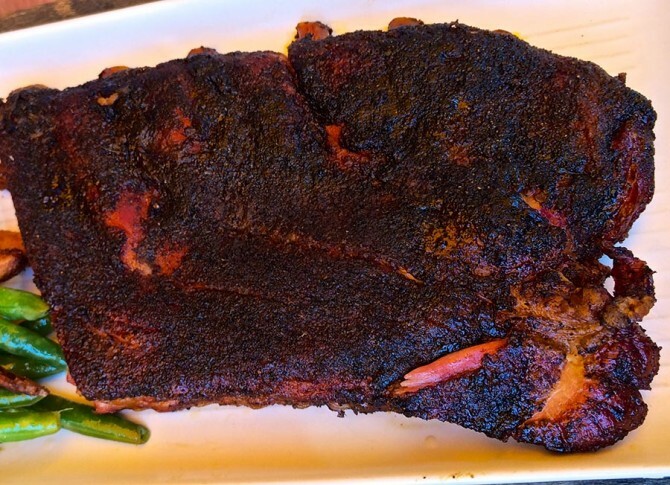 If you’re feeling like getting down and dirty, the half-rack of St. Louis style ribs is another delicious option. The meat literally fell off the bone, making it hard to eat but made for heavenly flavor. If you’re overwhelmed by the number of mouth-watering options, don’t worry. Salt + Smoke offers deals where you can combine two smaller-portioned entrees for the price of one entrée. I tried to be healthy so I ordered the green bean and tomato salad as my side and was extremely happy with my choice. 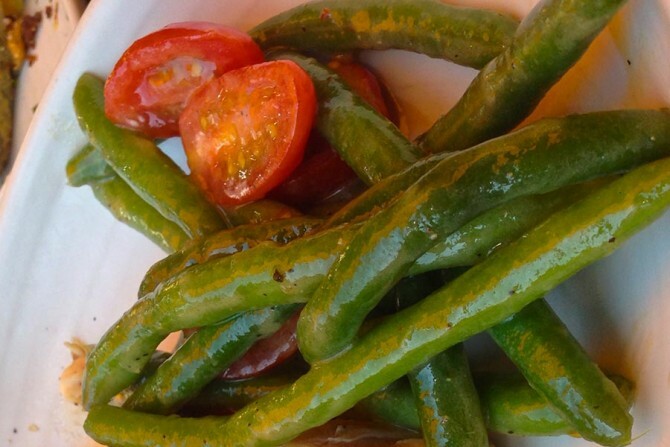 The green beans and tomatoes were tossed in a tangy-sweet dressing, giving my veggies a surprising but satisfying flavor. After all that heavy carnage, a simple and light side was definitely a refreshing choice. On the less healthy side, the garlic and herb fries did not disappoint. 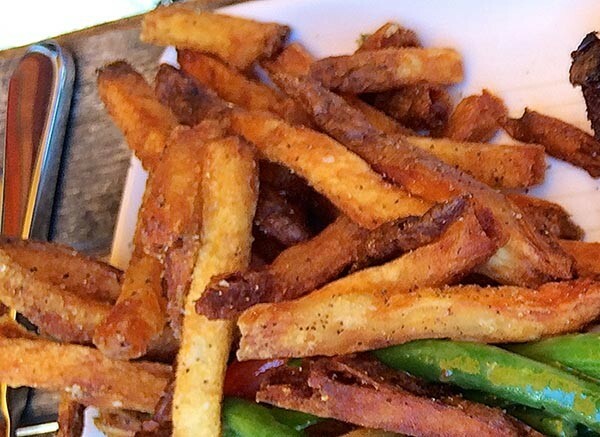 But let’s be honest – there’s rarely any disappointment when it comes to French fries. Eating barbecue outside on a gorgeous day was definitely the best way I could have spent my Saturday. Salt + Smoke provide a great atmosphere and definitely fits within the typical college student’s budget. It’s a great place for lunch or casual dinner with friends—definitely worth adding to your St. Louis bucket list.